If you haven't tried sunflower seed butter, it is a great alternative. Instead of cursing to my gestational diabetes daily, now I eat these bars and still feel satisfied and keep my sugars under control! Go baby Ella!!! I got all the nutrition info for this recipe down below as well, so you are all set! They are high in protein and low in sugar and you can even try with cacao nibs instead of dark chocolate chips for less sugar! Ella's Bars, makes 16, 59 gr bars. 1. Chop almonds to chunky pieces either by knife or food processor. 3. 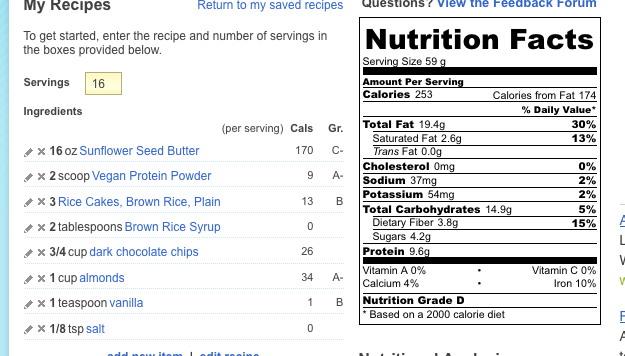 Mix the almonds, rice cakes, protein powder, chocolate chips and salt in a big mixing bowl. This is easiest with my hands. 4. Add the sunflower seed butter, rice syrup and vanilla to the bowl. Mix with a wooden spoon until all incorporated and sticky. Line a 9X13 baking pan with parchment paper and press the mixture into the pan quite firmly. Cover and place in the fridge for a few hours before cutting it into bars. Anything made of chocolate brings makes my mouth water. Would like to give it a try. Keep up the good work. purple and green girl, chocoholic, dreamer, romantic, baker and a mean voleyball player and sometimes all of the above all day long!